Sonamarg means a 'meadow of gold'. The most important township in the fertile Sind valley, Sonamarg is the last major township in Kashmir on the road to Ladakh. Sonamarg is also the staging point for some of the most popular treks in the higher altitudes. 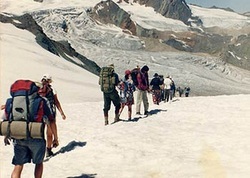 A pleasant one day excursion from Sonamarg is to the Thajiwas glacier, 8 km away, and approachable by a pony over a well maintained track~ The most popular trek originating from Sonamarg is the Kashmir Lake Trek. It covers the lakes of Gangabal, Vishansar, Kishansar, and close to the Harrnukh peak. The trail first crosses the Nichinai Pass (13 ,387 ft) and then enters the alpine valleys that eventually lead to the Gangabal Lake. Vishansar, Vishnu's Lake, is just over 12,000 ft and slightly larger than the 12,500 ft Kishansar, Krishna's Lake. Gangabal Lake is the highlight of this trip. Protected by the three peaks of Mount Harmukh, Gangbal is 5 miles in circumference and offers the finest trout fishing anywhere in Kashmir. For your kind information we are completely equipped with Jeeps, all the camping equipment such as tents, sleeping bags, complete kitchen, food, trained camping staff, pack and riding ponies, trekking guides etc. and all the expertise required. On request we can arrange any of the treks and send you very detailed itineraries with costings.